Pool Season 2018 is almost here! We are open daily from Saturday, May 26 to Monday, September 3. Our regular hours are 10am to 9pm. See Location & Hours for exceptions to regular hours. 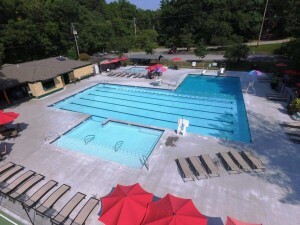 Southwest Swim Club (SWSA) is a member-owned private swim club in Columbia, Missouri. Access to the club is by members and their guests only. Our location is at the corner of Stadium Blvd and College Park Drive in the Old Southwest neighborhood. Our pool was completely rebuilt in 2014 and now boasts a large diving well, two diving boards, six lap lanes, a sun deck, and a separate (fenced) shallow baby pool. The pool is surrounded by a concrete deck with umbrella tables, chairs, and lounge chairs. Members also have access to our three tennis courts, basketball court, beach volleyball court, shuffleboard, pickle ball court, and enclosed playground. Please visit our Membership page for application and instructions.